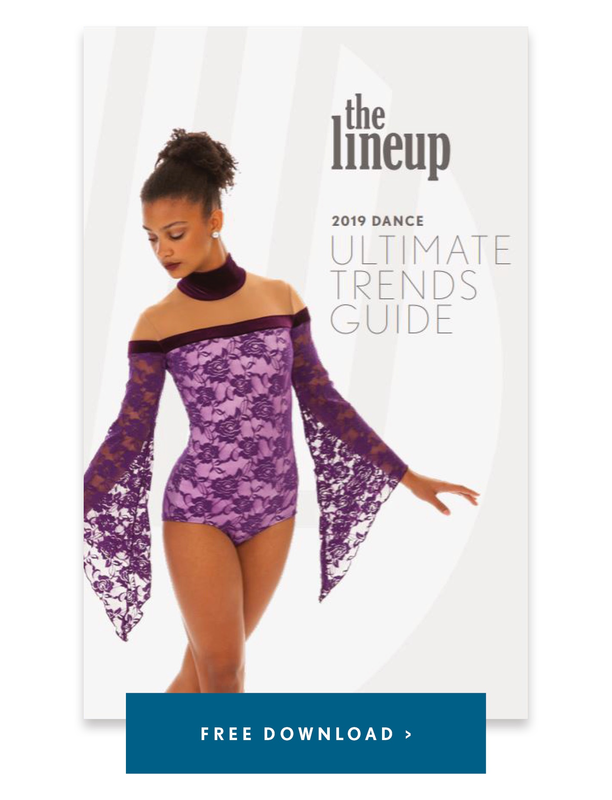 Team Spotlight: NDTC National Champions Seton Dance Team! 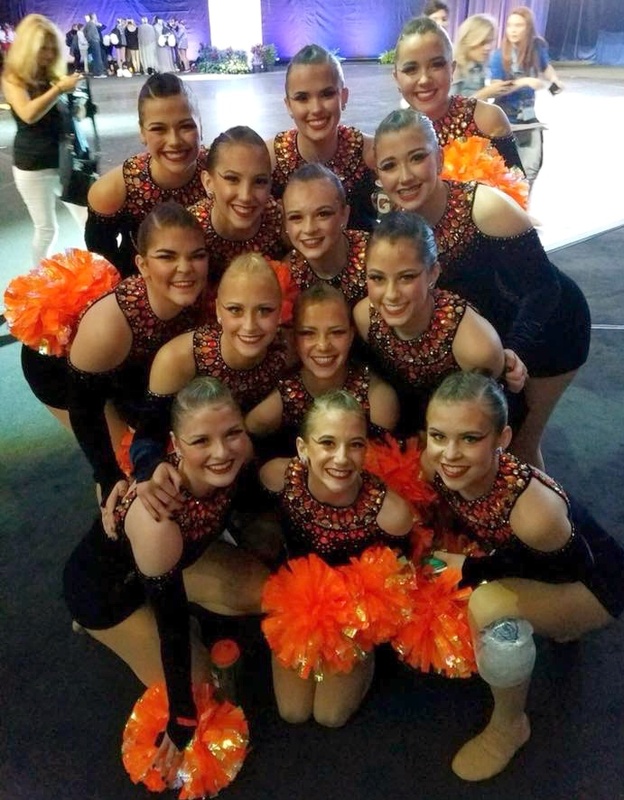 Seton Dance Team took home first place in Small Varsity Pom at the 2018 UDA National Dance Team Championships in February! 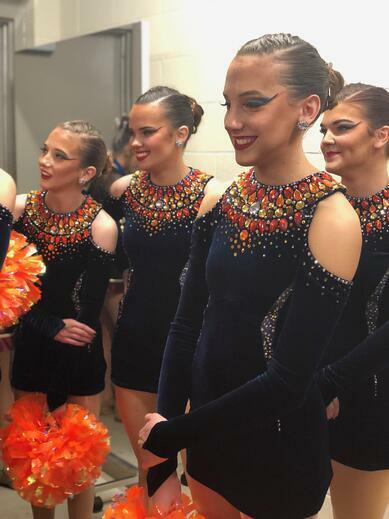 The road to nationals wasn't easy - from team injuries requiring re-staging, to heavy DIY rhinestones that never seemed to stay in place - the team had a few obstacles to overcome before they became National Champs! 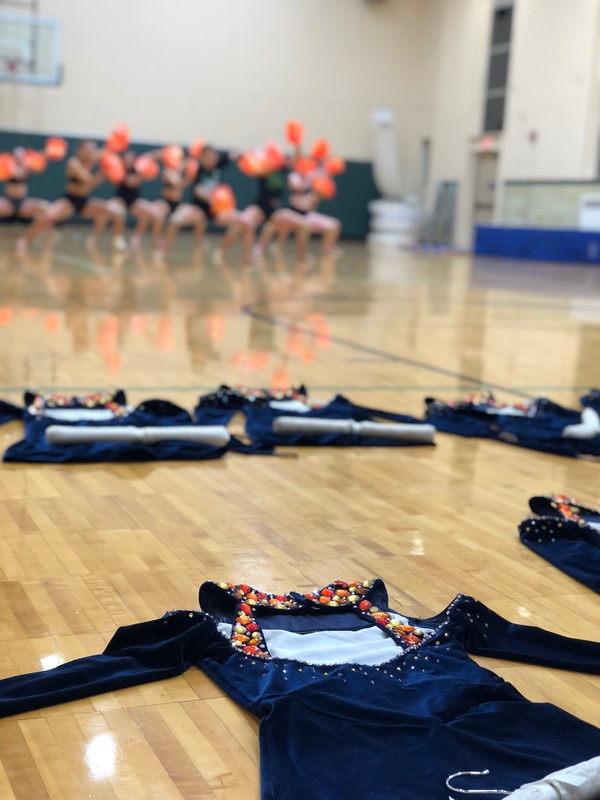 "The inspiration for the pom routine came from a dress we saw Rachel on The Bachelor wearing last spring. We coaches watch each Monday and often text each other during the show with commentary. On the night Rachel got the boot, she was wearing an amazing dress so I took a shot of it, texted it, and said 'this should be our pom dress for next season.' How can we make this work? We brainstormed and decided that it had a very tribal look to it, therefore we needed to do a tribal theme." To gather their ideas, the coaches created an extensive mood board and sketched out their costume ideas on paper. "We did some research on tribal patterns and colors, " Theresa said. 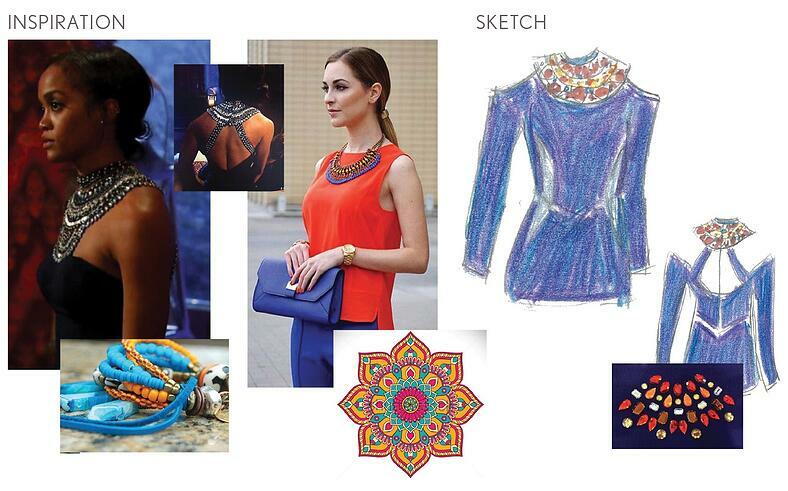 "The mandala around the neckline and the blue/orange color palette all came from that research." 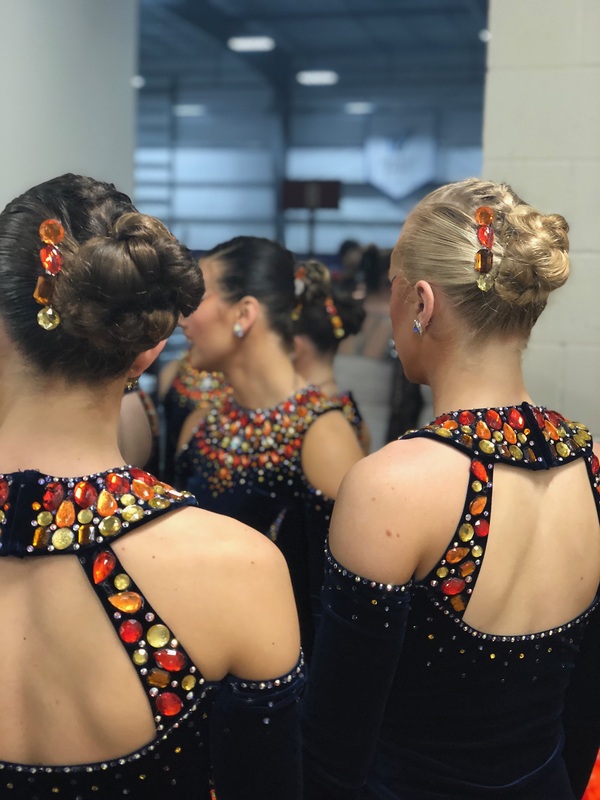 The team rhinestoned the navy velvet dress themselves with oversized and colorful orange stones. The jeweled collar was the key to turning their simple and chic base garment into a truly spectacular themed uniform! But the rhinestones weren't without some challenges due to their size! "We (SHS coaches) had a clear vision and we were determined to make it come to life," Coach Anna Miller explained. "However, I can't count how many times we re-stoned that costume!! And it was all worth the hours of re-glueing!!" To top off the concept, the music selections were full of rhythmic beats and drumming, and their choreography reflected the fast paced, staccato nature of the music. The choreography was done by Tribe 99 Choreography. "We are not afraid to take chances and strive to keep things fresh," Theresa said, which is certainly true! Congratulations, ladies, on your National Championship! Check out more Q & A with Theresa and a video of their performance below! All of the music we used had a "tribal feel” to it, with lots of drums and chanting. Actually one of our favorite parts of our routine was the section we called drums. 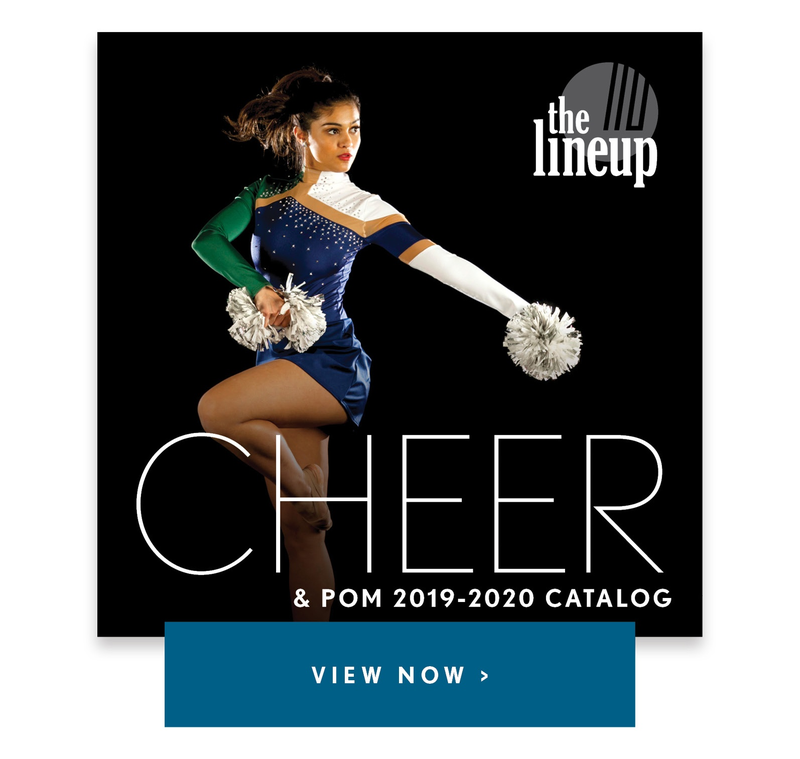 It was a very syncopated tribal beat in which we incorporated some non-traditional pom work. What makes your team/group unique? Our creativity. We work very hard to make sure that we are always pushing ourselves creatively (no matter what the routine) so that our routines have a different look/feel/vibe from year to year. We are not afraid to take chances and strive to keep things fresh. What is your favorite fan memory, or what are you most excited for this season? 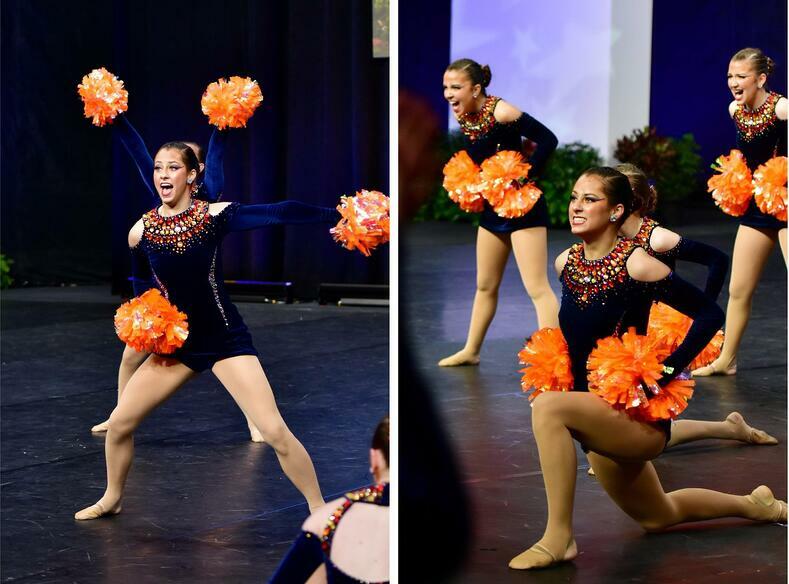 The Pom routine finals performance at the NDTC last weekend. We had been working SO hard on that routine, and just kept tweaking and tweaking until we felt it was perfect. And to see it come together with the execution and energy the team delivered on finals night was one of those special moments that as coaches we will never forget. The biggest challenge as a team was overcoming the many injuries we had this season. 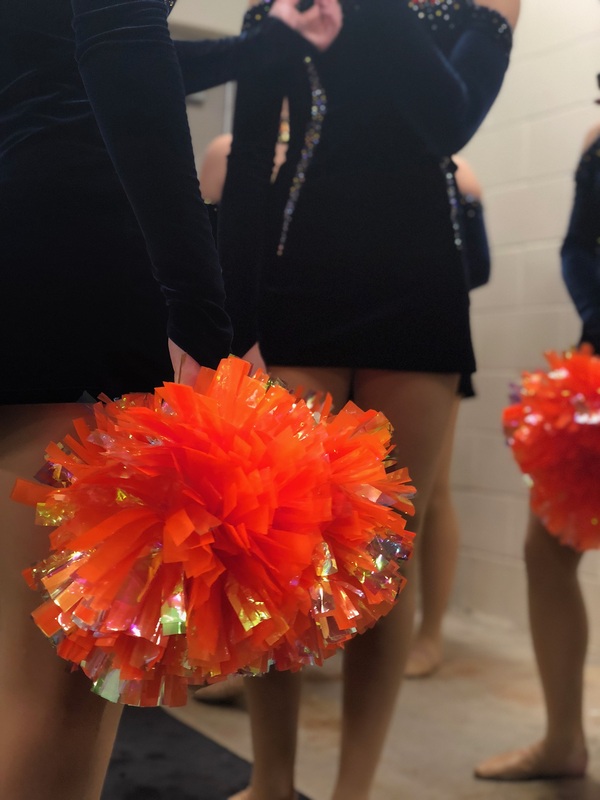 As many times as we performed/competed this pom routine, it was never the same twice. We were constantly re-staging due to girls going in and out due to injuries. Consistency and cleanliness was very difficult to attain because every week we were just worried that each girl knew her new part for the performance that coming weekend. The biggest challenge with the costume was keeping all those stones glued on around the neckline. They were heavy….and constantly popping off. We would stand in huddle and you could literally hear them plinking off the floor. We would just scoop them up after each performance, take them back home and re-glue them each week.